Sir John Heveningham, another knight and his son William – regicide. Sir John was born in 1577 to a Norfolk family with a colourful pedigree – the Heveninghams claimed to be descended from one of the men who guarded Christ’s tomb. More realistically they originated from Suffolk. Suffice it to say the Heveninghams did all the usual things associated with county gentry i.e. education (in this case Cambridge), study of the law, JP, sheriff and member of parliament. In January 1627, John Heveningham was summoned to appear before the Privy Council for his failure to pay Charles I’s forced loan. He was packed off to the Marshalsea. Being a gentleman it was assumed that he wouldn’t skip town so was allowed, in July, to take himself back to Norfolk to put his affairs in order. Having done that he was placed under house arrest in Shropshire before being moved back to London once again for a stint in the Fleet Prison. It was from the Fleet that Heveningham petitioned the King’s Bench for a bill of habeas corpus which would have tested whether or not he was being legally detained. The matter was not resolved legally on account of the fact that the bench had no desire to alienate the king but Heveningham and his four companions were released at the beginning of 1628. Heveningham found that becoming a jailbird had done his “street cred” the world of good in Norfolk where the king’s forced loan was deeply resented. He was returned to Parliament on a wave of popular support. Heveningham died in 1633. He was succeeded by his son William who was returned to Parliament in 1640. He served on the committee of the Eastern Association during the English Civil War so was in all respects a parliament man until it came to signing the death warrant of Charles I – which he refused to do in his capacity of commissioner to the high court. Despite this William did agree the execution of the king in his role as member of parliament which was sufficient to make him a regicide. Having disposed of the king William took a back seat in the running of the country but did manage to acquire rather a lot of sequestrated estates during the Commonwealth period. Unfortunately for Heveningham the monarchy was restored in 1660 and whilst many things were conveniently forgotten regicide was not. Heveningham surrendered himself, was put on trial and found guilty of treason for his part in Charles I’s death. The fact that he had not signed the death warrant itself, together with his wife’s determined petitioning saw him being packed off to Windsor Castle where he remained until he died in 1678. If you want an interesting and unexpected historical fact then it must be that Sir John Heveningham was a trustee of the Paston estate – his wife Bridget was a Paston – as in the fifteenth century letters family- demonstrating the small pool of landed families in each county that intermarried over the centuries to create a tight knit network or a smouldering keg of interfamilial feuding. As for William Heveningham, he married in 1650 to Mary Carey the daughter of the Earl of Dover. The earl was John Carey, a son of Henry Lord Hunsdon – the son of Mary Boleyn…and potentially Henry VIII. Sir William Brooke (1565-1597) was the son of William Brooke, 10th Lord Cobham Warden of the Kent Cinque Ports (1527 to 1597) pictured at the start of this post. He was of a similar vintage to Robert Devereux, Earl of Essex and Elizabeth’s replacement for Dudley in the royal favourite stakes after his death in 1588. Like other Elizabethan gentlemen he did a stint in the continental religious wars being knighted by Essex in 1591 at Dieppe. He was, in short, one of the new breed of men in Elizabeth’s court. Having done his time abroad he was then returned to Parliament as MP for Rochester at the behest of his father. Lord Cobham was not terribly amused that of the two MPS for Kent it was Sir Robert Sidney (brother of Sir Philip Sidney, nephew of Robert Dudley Earl of Leicester) who was returned as the senior parliamentarian. Elizabeth noted that it wasn’t very helpful that both men were abroad at the time. The fact that Brooke was also outlawed was also an issue. Elizabeth had decreed that members could not take their place until they had settled with their creditors. The matter must ultimately have been settled to Elizabeth’s satisfaction because he is described by Margaret Cavendish as one of her favourites. Certainly, in June 1597 William had been made Keeper of Eltham Great Park though whether it was because he was a royal favourite or because his family was an important one is something that probably bears further consideration. The family links with Elizabeth are in themselves interesting. Clearly being a Kent family the Boleyn equation and Kent gentry affinity comes into play. Anne Boleyn sent George Brooke 9th Lord Cobham (1497-1558) a letter telling him about the birth of Elizabeth in September 1533 but he was also one of the judges that tried the queen just three years later. The following year at the christening of young Prince Edward it was Lord Cobham – our William’s grandfather- who carried consecrated wafers for both the illegitimised Tudor princesses. George’s story continued to be tied to that of Henry VIII’s children and it is evident that he was of the reforming persuasion in his beliefs and the way in which he had chosen to have his children educated. The reign of Mary Tudor was made difficult not only by his faith but by the fact that he was related to Sir Thomas Wyatt through marriage. Wyatt even wrote to him demonstrating the belief that Cobham would side with him against Mary to put Elizabeth on the throne. He and his sons were arrested and there can be no doubt that Thomas Brooke had sided with Wyatt until the end. After that Lord Cobham who spent some time in the Tower kept his head down. He entertained Cardinal Pole and he made enquiries about heritics.. He died just before Mary so never saw Elizabeth ascend to the throne but the new Lord Cobham, William who had also been imprisoned in the Tower for his suspected part in Wyatt’s rebellion was on hand to play his allotted part in Elizabeth’s court and the administration of Kent as well as the Cinque Ports. Clearly our Brooke was a bit of an Elizabethan wild boy and this led to his untimely end when he insulted Elizabeth Leighton the slightly pregnant lover of Sir Thomas Lucas of Colchester. Lucas called him out and he was mortally wounded one cold December morning in Mile End at a rapier’s end. He was carried home where friends and family visited him as he lay dying. The will was proved on the 25 December 1597. For those of you who like to know these things, George Brooke was executed for plotting against James I in 1603. One letter described William Brooke as “misfortunate.” Two arrest warrants were issued for Lucas by the privy council – on on the 24th of December and a second on the 30th. This was was very unfortunate for Elizabeth Leighton who bore an illegitimate child also called Thomas who would not meet his father until he was six years old when James I pardoned Lucas and he was able to return home. He and Elizabeth went on to have seven more children of whom the youngest, Margaret would go on to serve Queen Henrietta Maria and marry the Marquis of Newcastle going down in history as Mad Madge. She would also write her biography, just because she felt like it even though society disapproved of the idea of women writing books for publication and tell the story of her father’s duel. It is perhaps not surprising that Lucas found himself at the wrong end of an arrest warrant, William Brooke’s father the 10th Lord Cobham (who had died on March 6 1597) was a man with clout. Brooke’s sister Elizabeth was the wife of Sir Robert Cecil – the most important man in the kingdom. She had also died at the beginning of 1597 but there were still family and political ties that were wielded by the new Lord Cobham – Henry Brooke – pictured left. He had been invested as Warden of the Cinque Ports on the same month that his father died. In addition to which Whitaker makes the salient point that Elizabeth was already tetchy with the Lucas family because Sir Thomas’s sister Anne had gone to court to serve as a lady in waiting but then married for love against the queen’s wishes. Anne had defied the queen to marry Arthur Throckmorton who was the younger brother of Bess Throckmorton who, of course, irritated Elizabeth monumentally by marrying Sir Walter Raleigh demonstrating once again that everyone in the Tudor court is related somehow or another! And who would have thought that in reading around the topic of Margaret Cavendish as part of the Stuarts in Derbyshire course I am currently delivering that I should encounter a tale of Tudor passion that correlates to Elizabeth I and her various favourites which happens to be part of another course that I am currently teaching. George Villiers, pictured left, was not the scion of a powerful family but he had received the kind of education, at his mother’s insistence, that a courtier required. His good looks had attracted James I’s attention. This was enough to ensure that the enemies of Robert Carr, the king’s then favourite, paid to raise George to the post of the King’s cup bearer. The rest as they say, is history. By 1619 George was the Marquis of Buckingham and in search of a wife. Families looked at their unmarried daughters and wondered if the investment of a bride would improve their own fortunes. However, Buckingham and his mother Mary Beaumont already had a bride in mind. Lady Katherine Manners was the daughter of the 6th Earl of Rutland. She was the earl’s sole heir. Her older brothers, Henry and Francis, had died in mysterious circumstances. The whole family fell ill in 1613 after dismissing a woman and her two daughters from their service. Henry died. Three years later nine women were hanged in Leicestershire having been found guilty of bewitching a child. Then in 1618 Francis also died and the Manners family sought the arrest of the three women and the monument to the two boys makes it clear that the earl held witchcraft responsible for the death of the boys, “Two sons – both died in infancy by wicked practice and sorcery”. The three women became known as the Belvoir Witches. Joan Flower, the mother protested her innocence from her arrest and during her imprisonment in Lincoln but her daughter Margaret confessed that Joan was a witch and her other daughter Philippa said that they were all witches. Joan died in prison and was buried at a crossroads, Margaret was hanged and in some versions of the story Philippa escaped from jail. Tracey Borman offers a different theory. She records that the Flower women were employed as servants prior to a visit by King James I but that they were unpopular with Belvoir’s other servants and accused of pilfering. Borman goes on to note that the women had a reputation for herbal cures and late night entertaining – of males. They, she argues, were convenient scapegoats. In fact the boys had been murdered on the orders of George Villiers. There is some evidence to suggest that by 1618 George Villiers, a Lincolnshire landowner, had his eyes set on a wealthy prize – which if she became a sole heiress would become even wealthy. Most historians consider that on the death of her brothers Katherine Manners became the wealthiest heiress in the country with estates in Yorkshire and Northamptonshire as well as her mother’s dower estates that came from the Knyvet family. Katherine was considered a plain woman but more alarming so far as King James I was concerned, she was a Catholic. Both those factors aside Katherine’s father was against the proposed match. He knew about George Villiers. He had seen the king’s favourite at court and seen the way that the king and George fondled one another in public. Nor was Rutland terribly amused by the fact that George wanted a hefty dowry along with the plain heiress. For the time being the wedding was off. But then in March 1620 Mary Beaumont, George’s mother visited the Countess of Rutland when the earl was away from home. She invited Katherine to dine with her, promising to bring her back home that evening. The countess of Rutland, Katherine’s step-mother, agreed. Mary entertained Katherine in her lodgings in Whitehall but did not send the girl home. She claimed that Katherine was ill and could not return home. To make matters worse, George who had also been invited to dine, failed to return to his own lodgings which were within walking distance. Poor Katherine was ruined. She had stayed over night in the home of an unmarried man who had slept under the same roof. The earl of Rutland was furious. He refused to allow Katherine to return home and now found himself insisting that Villiers marry his daughter because her reputation was so badly tarnished. The scandal was so great that the lavish wedding that you might expect never happened. It was a private occasion witnessed only by the earl and the King on the 16 May 1620. It is difficult to know whether Katherine connived with Villiers and his mother in her own ruin. She certainly appeared to dote on her husband even if he did not love her in return. Nor did she lead a very happy life with George. She hated the way he lived his life at court, his relationship with the king and the fact that George didn’t stop having mistresses just because he was married. Come to think of it much of Europe was scandalised by George’s behaviour, especially when he travelled to France in 1625 and became besotted with the French queen Anne of Austria – as in Dumas’s story of The Three Musketeers. Katherine had converted to Protestantism before the marriage but returned to Catholicism during the course of her married life and if her letters are anything to go by she did not simply accept George’s infidelities, sometimes using her health and emotions as a way of trying to control her husband’s behaviour. Life cannot have become any easier for Katherine when George, a Duke since 1623, became the target of national hostility because of Charles I’s foreign policy. George was widely assumed to be responsible for the assorted disasters that beset the English. Parliament attempted to arrest him in 1626. It was only his friendship with the king that saved him. Two years later George was killed by John Felton in Portsmouth. During the next seven years Katherine could only watch as her four children with George were adopted into the royal family to be raised with Charles I’s children. In 1635, much to the king’s fury she married the 2nd earl of Antrim, Randall McDonnell, a man six years her junior. Eventually Katherine convinced Charles that she had married for love and that Randall had no intention of disinheriting her children. Edward III is sometimes described as “The Father of the Nation.” According to one of my old copies of Who Do You Think You Are magazine approximately four million people along with the likes of Danny Dyer are descended from King Edward III. Ian Mortimer’s book on Edward III suggests that the actual figure is somewhere between 80 and 95% of the population of England- perhaps ‘Father of Millions’ would have been a better name. So, where to start if you want to know more about Edward III? Edward III was rather helpfully the son of Edward II. Edward II was married to Isabella of France – the warmly named “She-Wolf” who arrived in England aged twelve to discover that her spouse had a preference for his male companions, in particular Piers Gaveston and Hugh Despencer. Chroniclers of the period are disapproving of Edward’s friendships. To cut a long and complicated story down to size Edward II was deposed by Isabella and her lover Roger Mortimer when young Prince Edward was just fourteen. Edward II disappeared from the scene via Berkeley Castle and a helping hand; though there are some interesting theories that his death was somewhat exaggerated. Young Prince Edward became King Edward III though the power behind the throne was in the hands of his mother and Roger Mortimer. Edward III became increasingly concerned about his perilous position vis a vis Mortimer who behaved as though he was king. Edward, aged just seventeen in 1330 seized his opportunity in Nottingham when his men were able to sneak into the castle through a network of tunnels, surprise Mortimer and take back power. Edward III went on to reign until his death in 1377; some fifty years plus a few months. Edward married Philippa of Hainault in York Minster in 1328 and proved a most uxorious monarch though that didn’t stop him having several illegitimate children with his mistress, the avaricious Alice Perrers, after Philippa’s death. The royal pair had thirteen children of whom nine survived to adulthood – I’m not sure what the maths is but to expand from nine (plus a hand full of illegitimate children) to at least four million descendents is jaw dropping. If you want to understand the maths better double click on the picture at the start of this post to open up a new page and an article in the National Geographic which also explains how come you might be related to the Emperor Charlemagne even if you don’t have the family tree and paper trail to prove it. What do we know of Edward’s children? Let’s deal with the boys first. Edward of Woodstock, the so-called Black Prince and the hero of Crecy was born in 1330. He made a love match with his cousin Joan of Kent (who had a dodgy marital past of her own). They had two sons but the eldest died when he was just six. The second boy, Richard of Bordeaux, became Richard II when his grandfather died – the Black Prince having pre-deceased his father. Richard II had no children. So far so straight forward and no sign of the four million. Lionel of Antwerp was Edward’s third son but only the second to survive to adulthood. Lionel was married twice. His second bride was Violante Visconti of Piedmont. Lionel died shortly after arriving in Italy and definitely before he had the chance to go doing any begetting. The word ‘poison’ was bandied around at the time and it should be noted that Violante’s second husband was also murdered. Lionel did have a child from his first marriage– a girl called Philippa who found herself married into the Mortimer family in the person of Edmund Mortimer (a difficult opening conversation might have been “your grandfather was my grandma’s lover and then my dad had him dragged off and executed!”) The House of York would one day base its claim to the English throne on its descent from Philippa. That line was also descended from Lionel’s younger brother Edmund of Langley hence the York bit. There are rather a lot of girls in Lionel’s strand of descent through the family tree. Reason enough for bloodlines getting lost over time as younger daughters of younger daughters gradually tumbled down the social ladder and that’s before warfare, treachery, bad luck as well as just being plain unimportant get involved in the equation. The next son to arrive in Edward III’s and Philippa of Hainhault’s nursery was John of Gaunt. John, the duke of Lancaster, through his first marriage to his distant cousin Blanche fathered the Lancastrian line of kings – Henry IV, Henry V and Henry VI. He had two daughters with his second wife Constance of Castile but they married royalty on the Iberian Peninsula. It is through one of them that Katherine of Aragon is descended from Edward III. John of Gaunt also had a third family with his mistress Katherine Swynford. This family was later legitimised by the pope and by parliament. This family were called Beaufort after one of John’s castles in France. It is through the Beaufort line that Henry Tudor would one day make his claim to the throne. Students of the Wars of the Roses know that the problem for the House of Lancaster was that there was a shortage of males by 1485, hence the rather dodgy claim of Henry Tudor. However, there were plenty of girls in the distant family tree when you look at it closely – all of them, well at least the ones who didn’t die in infancy or become nuns, contributing to the projected four million descendants of Edward III. The next prince was Edmund of Langley who became the duke of York. He married the younger sister of John of Gaunt’s second wife Constance of Castile and there were offspring. Edward III had three more sons after that, Thomas and William who both died in infancy and then came Thomas of Woodstock who was created duke of Gloucester. He’s the one who ended up murdered in Calais on the orders of his nephew Richard II – a mattress was involved – but not before he’d fathered a number of children. Now – for the girls who, it would have to be said, are much more straightforward. Edward III’s eldest daughter was called Isabella. She had two daughters, one of whom married in to the de Vere family – meaning that the earls of Oxford can trace their ancestry back to Edward III as well as to other Plantagenets. The next girl was called Joan and she was one of the first victims of the Black Death that struck in 1349. Her sister Blanche died in infancy in 1342. The next two sisters weren’t particularly long lived either. Their names were Mary and Margaret. So far as history is currently aware none of the last four had offspring. Edward III also had a number of known illegitimate children. Alison Weir lists them as John Surrey, Joan, Jane and possibly Nicholas Lytlington who became the Abbot of Westminster but there is uncertainty as to his paternity. He could also have been a Dispenser. I should like to say that as an abbot it isn’t really an issue, except of course being in clerical orders doesn’t seemed to have prevented rather a lot of the clergy from fathering children. And those are the key names if you’re one of the four million. Of course, it turns out that if you’re from Western Europe and understand mathematics (its true apparently even if you don’t understand the maths) you’re also related to the Emperor Charlemagne – which is mildly disconcerting. If you just want to find out more about Britain’s royal genealogy then the most comprehensive place to look is at Alison Weir’s Britain’s Royal Families published by Vintage Books. I’m off to find my gateway ancestor… though I must admit to never having seen a genealogical expert just sitting around, waiting for me to turn up in order to point me in the right direction. Ho hum! What a gem! Great Malvern Priory was founded in 1085 by a hermit, Aldwin, from Worcester Abbey on land belonging to Westminster Abbey. This means that during the life of Great Malvern’s monastic establishment it looked to Benedictine Westminster for direction which is why it’s a priory rather than an abbey in its own right. Aldwin was supported and guided by Bishop Wulfstan of Worcester who went on to become one of King John’s favourite saints. The priory also received its charter and funding from William the Conqueror who gave charters to many monasteries – a reminder that the conquest of England had the Pope’s blessing and that William was conscious of the need to give thanks for his victory. Henry I and Edward III confirmed and renewed the charter. The priory wasn’t without its problems though. The fact that it was on Westminster Abbey land but founded by a monk from Worcester and looked to the Worcester for guidance led to friction at various times in the priory’s history. The pillars in the nave of today’s building are Norman and there are odd clues to the Norman past scattered about the building but the priory as it stands today dates largely from the fifteenth century. The Bishop of Worcester was called upon to consecrate the new build in 1460 – just as the Wars of the Roses really got started (Battle of Wakefield December 30 1460). However, the new build ensured that assorted Lancaster and York monarchs added their ‘bit’ to the decor from Henry VI’s tiles via Richard III’s stained glass windows to Henry VII. At least those monarchs wanted to enhance the building, finished in 1502. In 1535 Dr Legh, one of Cromwell’s commissioners and a bit of a thug by all accounts, visited the priory. Things can’t have been that bad as there is no report of his findings amongst Cromwell’s documents. According to the Valor Ecclesiasticus of 1535, the income of the prior and convent amounted to £375 0s. 6½ d. It escaped the act suppressing the small monasteries, although a cell belonging to the priory wasn’t so fortunate. In 1539 the monastery was dissolved despite the please of Hugh Latimer the Bishop of Worcester (he would ultimately go to the flames in the reign of Mary Tudor for his Protestantism). He wrote to Cromwell on behalf of the prior; ‘at the request of an honest man, the prior of GreatMalvern, of my diocese,’ pleads for the ‘upstandynge’ of his house, and continuance of the same to many good purposes, ‘not in monkery . . . but to maintain teaching, preaching, study with praying, and (to the which he is much given) good “howsekepynge,” for to the “vertu” of hospitality he hath been greatly inclined from his beginning, and is very much commended in these parts for the same . . . The man is old, a good “howsekepere,” feeds many, and that daily, for the country is poor and full of penury. Alas, my good lord, shall not we see two or three in each shire changed to such remedy? . . Sir William Kingston can report of the man further.’ The letter dated 13 December 1538 finishes with flattery: “Blessed be God of England that worketh all, whose instrument you be! I heard you say once after you had seen that furious invective of cardinal Pole that you would make him to eat his own heart, which you have now, [I trow], brought to pass, for he must [needs] now eat his own heart, and be[as] heartless as he is graceless.” Latimer went on to offer Cromwell 200 marks and the king 500 if they would spare the priory. Not that it did any good. By January 1539 the priory had been suppressed and the lead stripped from its roof. The prior, one Richard Whitborn, received h £66 13s. 4d. each year. Ultimately, in 1541, the parishioners of Great Malvern purchased the priory for £20.00 as the original parish church was in a poor state. They acquired the “stateliest parish church in England.” The parish church of St Mary and St Michael is without a shadow of a doubt a show stopper. A second post will consider Great Malvern’s medieval tiles whilst a third post will explore the wonderful medieval windows and also a fourth post on the glass given by Richard III and by Henry VII. As you might guess, I spent a very happy morning in Great Malvern Priory although I wasn’t able to study the misericords (the ledges on which the monks could rest during services) because of work being done in the choir of the church. Great Malvern is unusual in that as well as depicting a mermaid on its misericords it also has a merman. For fans of C.S. Lewis it is also worth noting that he went to school in Malvern College just before World War One and whilst he was there he may have been inspired by the enclosed east doors of the priory church which ultimately turned into the wardrobe by which the Pevensies entered Narnia. A glimpse through the lock reveals a fir tree and a lamp post. ‘Houses of Benedictine monks: Priory of Great Malvern’, in A History of the County of Worcester: Volume 2, ed. J W Willis-Bund and William Page (London, 1971), pp. 136-143. British History Online http://www.british-history.ac.uk/vch/worcs/vol2/pp136-143 [accessed 16 August 2016]. Cleop. E. iv.264. B. M.Wright’s Suppression of the Monasteries,148. ‘Henry VIII: December 1538 11-15’, in Letters and Papers, Foreign and Domestic, Henry VIII, Volume 13 Part 2, August-December 1538, ed. James Gairdner (London, 1893), pp. 438-455. British History Online http://www.british-history.ac.uk/letters-papers-hen8/vol13/no2/pp438-455 [accessed 23 August 2016]. ‘Parishes: Great Malvern with Newland’, in A History of the County of Worcester: Volume 4, ed. William Page and J W Willis-Bund (London, 1924), pp. 123-134. British History Online http://www.british-history.ac.uk/vch/worcs/vol4/pp123-134 [accessed 16 August 2016]. Edward IV’s wily mistress…or should that be elusive mistress? I’ve become side tracked by Edward IV’s mistresses and illegitimate children. I’ve already posted about his holiest mistress – Lady Eleanor Butler and I posted last year about the ‘merriest mistress’ Jane, or rather Elizabeth, Shore. I may write another post about her in due course. That just leaves the wiliest mistress – who would appear to be Elizabeth Lucie or Lucy nee Wayte and who often merits only a sentence in works on Edward IV because unlike the other two very little is known about her. There were other women as well but they seem to have been so numerous and so unimportant in the great scheme of things that no one bothered to jot down their names. Polydore Vergil writing after 1505 for his Anglica Historia commissioned by Henry VII suggests that Edward may have made overtures in some very inappropriate places – including the Earl of Warwick’s wider household “and yt caryeth soome colour of truthe, which commonly is reportyd, that king Edward showld have assayed to do soome unhonest act in the earls howse; for as muche as the king was a man who wold readyly cast an eye upon yowng ladyes, and loove them inordinately.” Obviously it wasn’t in Vergil’s best interest to sell the York king as a choir boy but then neither did anyone else. Commines noted that much of Edward IV’s problem was his interest in pleasure. Mancini described him as “licentious in the extreme.” He also wrote “he (Edward) pursued with no discrimination the married and unmarried the noble and lowly: however he took none by force.” According to Ross, the Croyland Chronicle was amazed that Edward was able to rule a kingdom whilst partaking of so many “sensual enjoyments.” Gregory’s Chronicle, which Ross notes is the most contemporary of the reports, commented that Edward wasn’t very chaste…something of an understatement it would appear. Byrne is much more clear cut in her introduction to the Lisle Letters. She places Elizabeth Lucy as being a nineteen-year-old widow of Lancastrian connections from an established Hampshire family holding a number of manors when she met the king. Any way, Elizabeth daughter of Edward IV married Thomas Lumley of Durham. The Duchess of Cambridge is numbered among her descendants. Further evidence as to Elizabeth’s royal father is provided by the papal dispensation which allowed Elizabeth’s son Roger to marry Anne Conyers – the two of them being related within the prohibited degrees of affinity (something like fourth cousins) Testamenta Eboracensia 3 (Surtees Soc., vol. 45) (1865): 355). History isn’t totally sure what happened to Elizabeth Lucy nee Wayte. She simply disappears from the records which suggests that either the king was no longer interested in her, she died or if she was from the lower social orders simply got on with her life along with countless other undocumented medieval people. Putting a post on Elizabeth Lucy together is rather like a composite character exercise! Edward IV did have other illegitimate children, not counting his children with Elizabeth Woodville who found themselves delegitimised by their Uncle Richard, but history doesn’t provide them with mothers. Grace Plantagenet, for example, turns up at the funeral of Elizabeth Woodville but beyond that we know very little. There is a tantalising hint of an unknown daughter marrying into the Musgrave family but it was unsupported by any evidence. There’s a better evidenced possibility of the wife of the 6th Baron Audley being one of Edward IV’s daughters – though I’m sure that there are probably arguments for her being someone else entirely! Elizabeth Waite, in Lundy, Darryl. The Peerage: A genealogical survey of the peerage of Britain as well as the royal families of Europe. In October 1537 Henry VIII’s third wife, Jane Seymour, died from complications following childbirth. Henry, a man notorious for divorcing his first wife and beheading his second was in need of a new wife – or at least that was the view of his chief minister Thomas Cromwell. Cromwell’s attention initially fell upon Marie de Guise a young widow with a son – so a proven track record for the production of heirs. She was also purported to be a tall woman, something that Henry liked the sound of when he Marie was described to him. Marie however declined the offer of marriage explaining that she only had a little neck. She went on to marry James V of Scotland. Henry next suggested that all the eligible women in France on Cromwell’s list of suitable brides make like to meet in Calais – think of it as a Tudor hen night where the king could choose his next wife on the grounds that Henry didn’t trust his ambassadors and he was determined he didn’t want to marry an ugly princess. Unsurprisingly the prospective brides and their families were not terribly impressed with the idea – the French ambassador explained that diplomatic marriages were not horse markets . There was also the small matter of the fact that Henry had been excommunicated- which rather put off the Catholic brides. Ultimately Cromwell sent Hans Holbein on a fact-finding trip with his paintbrush and easel. One of the most striking portraits that Holbein painted at this time was that of sixteen-year-old Christina of Denmark. Christina was the younger daughter of Christian II of Denmark and Isabella of Austria (sister of Charles V). Christian was an early follower of Luther – even if Charles V was very Catholic. Christian was a bit of an unfortunate king – his wife died, his children were effectively confiscated by their Hapsburg uncle and then he managed to get himself toppled and imprisoned – so Christina of Denmark was actually more Christina of the Netherlands. In some ways she was already part of the English royal family because her great-aunt was none other than Katherine of Aragon. In addition to being a Hapsburg she was also, as this picture shows, a very pretty girl. She’d been married by proxy at the age of eleven to the Duke of Milan who was a mere twenty-six years older that her. He died two years later – hence the deep black of mourning- Christina returning to her uncle in Brussels so that he could arrange the next advantageous diplomatic marriage. Like Marie she was a tad concerned about the English King’s way with the ladies. She is supposed to have said that if she had two heads one of them would be at the disposal of Henry. Charles V who was looking for allies against the French seems little bothered about the way in which his aunt had been treated and was quite prepared to send his niece across the Channel…unless a better offer came along. As a consequence of the initial negotiations Holbein visited Brussels in 1538. Christina sat for a portrait but only for three hours. Holbein did his preliminary drawings, came home and whipped up the portrait. And what a portrait! This is the only full-length female portrait that Holbein made (I think if memory serves me correctly). The colours and the simplicity of the picture concentrate the viewer on Christina’s hands and face as does the beautifully executed fur collar. There is a hint of a smile on Christina’s face – perhaps she knew she wouldn’t have to marry Henry! Henry liked the portrait so much that he announced that he was in love. For some reason the negotiations did not continue. Christina married François, Duc de Bar in 1541, who succeeded his father as Duc de Lorraine in 1544 and died in 1545, leaving Christina Regent of Lorraine with three children. She died in 1590. As for the portrait – well Henry liked it so much he kept it. Ivo de Taillebois arrived in England in 1066 with William of Normandy. Accounts are not clear cut as to who his parents were, Fulk of Anjou is a possible contender for the title. There is also a suggestion that like William, Ivo may have been illegitimate. Many of the records related to Ivo are vague or lost. One thing is clear. He did well from the invasion. He gained parts of Lancashire, Westmorland and also Lincolnshire. He became Sheriff of that County two years after the invasion and features as an extensive landowner in the Domesday Book. There is some debate as to how Ivo acquired Kendal or Kendale, which later became a barony. The Strickland sisters say that he married a Saxon Noblewoman, Lucy, Countess of Chester, sister of the earls Edwin of Mercia and Morcar of Northumbria. Lands in Kendal would have come to him through his marriage but it is also evident that he was given lands by William Rufus. It is certain that he gave the church in Kendale to St Mary’s Abbey in York. It should also be added that the Scots were only driven out of Cumbria in 1092 – so Kendal was no sinecure. The remains of his motte and bailey castle can be viewed at Castle Howe, the stone castle is from a later period. But back to Lucy. She held lands in and around Spalding. This may have been part of the reason, along with his role as King’s man, that Ivo found himself in Ely taking up arms against Hereward the Wake in 1071. Lucy’s brothers were also caught up in the rebellion against the conqueror – making their lands forfeit- so Ivo seems to have done quite well out of it all. No one seems to have recorded what Lucy thought of all this or the fact that she appears to have been married not once, not twice but thrice (her third husband being Ranulf le Meschin) dying in 1131. One thing is clear though Lucy has disappeared into history leaving some very fragmentary and tantalizing historical evidence behind her. Sounds charming! And he was a forebear of Katherine Parr, Henry VIII’s sixth queen and also of George Washington. Captain John Hubbard served upon seven royal naval vessels during the reign of Charles II when the country was at war with the Dutch. In 1665 he commanded the Happy Return at the Battle of Lowestoft which saw a great victory. In 1666 he was made captain of the Royal Charles, previously known as the Naseby (and one of Cromwell’s most prized vessels). The following year he joined the Rupert; then the Plymouth, the Milford, and the Assistance. It was while on the Assistance that Captain John Hubbard was killed in action against some Algerine corsairs. Pepys talks about Hubbard being killed as a result of being overly brave. The Royal Charles became one of the Royal Navy’s biggest shames. 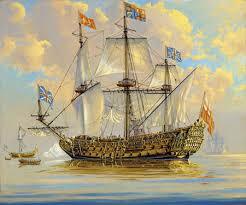 The Dutch fleet sailed up the Thames to Chatham in 1667. They cut the flagship from the fleet and carried it away. The ship was the Royal Charles. But on to Old Mother Hubbard who went to the cupboard. According to the rhyme she was going to fetch her doggy a bone. Of course the cupboard was bare. Apparently Old Mother Hubbard was, in fact, Cardinal Wolsey, making the cupboard in this instance the Catholic Church. The doggy (a.k.a. King Henry VIII) wanted an annulment from his queen – Katherine of Aragon – which was not forthcoming because the Pope found himself under the watchful eye of Katherine’s nephew. That just leaves the viking. Hubba the Horrible or Ubba was a brother of Ivar the Boneless and Halfdan. There is another school of thought that says it is a name that made its appearance with the Normans. Whatever the case Internet research suggests that anyone with the surname Hubbard, Hubbert or Hobart is descended from one John Hubba who is recorded as living in Suffolk in 1274. His family possibly descended from “Euro, filius Huberti” who can be found in the Domesday Book and who appear to have some familial link to William the Conqueror but I need to do much more research as yet.